The geophysical definition of a planet categorizes the worlds of the solar system by their composition. 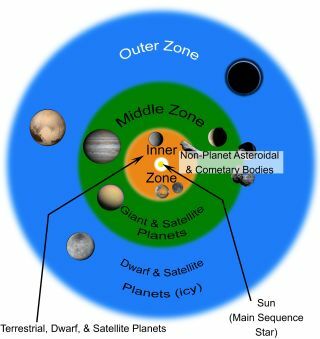 Rather than remembering the individual planets, students would learn about the types. THE WOODLANDS, Texas — There's new hope for people who still believe that Pluto is a planet more than a decade after the International Astronomical Union (IAU) reclassified the object as a dwarf planet. A group of planetary scientists is making the case that the definition for a planet should rely more on what an object is than where it is. Pluto's demotion came largely because the world fails to clear its orbit of other large objects (most notably, Neptune). But the proposed geophysical definition focuses on the physical properties of a body rather than the characteristics of its orbit, and would also include objects such as the dwarf planet Ceres and Jupiter's moon Europa. Runyon said many scientists who study the composition and features of worlds already define a planet based on the intrinsic attributes of the object, rather than on the object's interaction with its environment. He pointed to over 40 scientific papers on Europa and Saturn's moon Titan that refer to those bodies as planets. "Round moons like Titan and Europa have been referred to as planets for decades in planetary literature," Runyon said. "Our definition just newly encapsulates and formalizes a precedent already set." For more than 70 years, elementary students learned that the solar system contained nine planets. The discovery of objects beyond Pluto's orbit shook up this view, and in 2006, the IAU voted to change the definition of planet. The organization's definition said a planet orbits the sun, is not a moon of another object, is rounded by its own gravity and clears its orbit of other objects. In its annual journey, Pluto travels in the Kuiper Belt, a region of the outer solar system populated by many small, rocky, often icy objects. Because Pluto and the other round worlds in the Kuiper Belt they have failed the requirement to clear their orbits, and are classified as dwarf planets. The IAU doesn't define a dwarf planet as a subclass of planets, but rather as a separate class of objects altogether, a situation Runyon called "a grammatical absurdity." Against this, Runyon and a group of colleagues have written a proposal that would define a planet as a round object that has never undergone fusion (ruling out smaller, dead stars known as white dwarfs), regardless of its orbit. Not only would the new definition bump up the round dwarf planets into full-fledged planethood, but it would also add moons, or "satellite planets," as the new definition calls them, to the club. All the scientists named on the proposal are members of NASA's New Horizons mission to Pluto. That probe is now on its way to study another icy object in the Kuiper Belt. The agency has not released proposal is not an official stance by the agency. But Runyon said that whether a planet becomes round can depend not only on its size and gravity, but also on the strength of its material. For instance, while Saturn's moon Enceladus is roughly the size of the asteroid Vesta, the moon's weak, icy composition makes it round, unlike the rocky asteroid. He said he'd rather have roundness remain a bit less defined. "I'm going to stick with 'round' and 'not round,' and be content with a little ambiguity," he said. That doesn't mean all scientists have to reject the IAU definition, Runyon said. While the proposed definition might make sense for planetary scientists, he acknowledges that people who model the orbits of worlds or who search for worlds beyond the sun might be perfectly fine with the IAU's definition. He said scientists can rely on the definition that is most useful for them. That sort of thing already happens in astronomy, he said. For instance, while chemists refer to certain elements on the periodic table as "metals" based on their conductivity and ability to lose electrons, astronomers have for decades referred to everything other than hydrogen and helium as metals. Even within research papers, scientists will define a term in a specific way out of several options and use that definition consistently within the work. So, a field-wide consensus isn't always necessary, Runyon said. "We can live in happy coexistence," he said. The solar system hosts over 110 round worlds. Under the geophysical definition, they would all be planets. While Pluto fans have argued for its reinstatement as a planet for the last decade, what does it matter to scientists whether Pluto, Ceres and Europa are considered planets? Part of the motivation is the scientific impetus towards classification, Runyon said. "Scientific nomenclature facilitates communication and conceptualization about ideas," Runyon said. Classifying elements in the periodic table helped chemists understand these substances' properties and even predict the existence of undiscovered elements. Classifying different types of stars helped astronomers better understand these bodies' properties. Similarly, classifying the different kinds of worlds could help planetary scientists learn more about the formation and evolution of these objects. "Words actually carry a lot of weight," Runyon said. "Look at the last presidential election. Words are powerful." Runyon said he and his colleagues also think the definition of a planet affects the general public's perception of the importance of astrophysical objects. In the new definition proposal, the authors wrote, "many members of the public, in our experience, assume that alleged 'nonplanets' cease to be interesting enough to warrant scientific exploration. … To wit: A common question we receive is, 'Why did you send New Horizons to Pluto if it's not a planet anymore?'" That perception may color attitudes to more bodies than just Pluto, Runyon said. Water worlds — like Jupiter's moon Europa and Saturn's satellites Titan and Endeladus — may be some of the most promising sites for discovering life beyond Earth in the solar system. But, Runyon said, many people tend to ignore those worlds because they are called moons instead of planets. "These words fall off their mental radar," Runyon said. By classifying moons and other round bodies planets, the more than 110 known objects in the solar system that would be categorized as planets could pose a challenge to students. But Runyon recommended focusing more on objects' locations and how they form than on all those names. "Students ought not memorize lists of names, because you don't learn anything [doing that]," Runyon said. Instead of simply learning that some objects are planets and others are not, "I want them to learn there [are] lots of planets and here are the different types," he said. Runyon also said he hopes that this discussion about planetary definitions will help the public realize that scientists often disagree, and that this is healthy for science. Simply knowing that many or most planetary scientists consider Pluto and other dwarfs to be full-fledged planets, he said, could help make members of the public think more inclusively about different worlds in the solar system, regardless of their titles. "Stirring up negative emotions about Pluto and other dwarf planets turns people off to science," he said. "On the other hand, leveraging positive emotion for science is a win-win situation."